Last month I started a new series in which I wanted to share the photos I took throughout the month that didn’t warrant a blog post of their own. So, with another month now over, it’s time to share February’s photos. Nobody needs this many (bad) photos of small birds but I just can’t resist their cuteness! The snow returned (briefly) and I discovered once again that it’s really hard to take photos while snow is actually falling from the sky! The photo above was taken on a Friday morning. The sun came out in the afternoon and melted everything that had managed to settle… and would you believe the next day was bright sunshine and highs of 12°C? The weather has been so confusing lately! I had a week off at the end of the month and on a particularly sunny day I went for a walk into town (and beyond). It was 22°C that day. In February! I mean, it was nearly March, but still… 22°C! There were signs that spring was approaching! Can you spy the bee below? I walked all the way to the Birsfelden hydroelectric plant, which means nothing to you so you’ll just have to trust me that it was a reasonably long walk 😉 2km further and I would have been in Germany, but instead I decided to cross the river and head back since it was getting on for 3 p.m. and I still had to cook tea. Look how blue the water is? Aah, I love living here! I was paired up with Gale, who is an American living in the UK. I basically told her to surprise me – and she didn’t disappoint. First of all, my item arrived in an absolutely gorgeous box that has now become home to some of my crafting supplies! I then opened the lid to find that each item had been individually wrapped in its own piece of tissue paper. Opening the little packages was so exciting – like Christmas or my birthday! Snacks in the form of cashew nuts and flavoured corn nuts. I had never heard of corn nuts before, but now I neeeeeed to get my hands on more! They were delicious. I ate them all by myself! Jan didn’t even get a look in. Stuff to make chicken taste good. We love both garlic and spicy stuff in this household! Cous cous and coffee (pictured together because alliteration!). I absolutely love Ainsley’s couscous, and the coffee sounds so interesting. Various hot chocolates, including a Galaxy one!! Amazing! I love Galaxy! A tea towel decorated with chillis! Love it! Basler Mehlsuppe (flour soup) because it’s traditional for Fasnacht, which it was at the time. Zürcher Geschnetzeltes. A small bar of chocolate. Garlic sausage from Gruyeres, because she told me she loved garlic. Blevita crackers with Gruyere cheese. Jelly bunnies from the Easter selection and a Spitzbube (jammy biscuit). Fairly representative of Switzerland, I think. I’m not doing foodie pen pals in March because of New Zealand, but I can’t wait to take part again in April. If you too want to receive delicious foods from around the world each month, sign up for the April foodie pen pals now on the new foodie pen pals pen pals website! Everything you need to know is there. So, I promised to tell you all about Salzburg. And here I am, getting ready to tell. Where to begin? This time, our New Year’s holiday was almost a week. 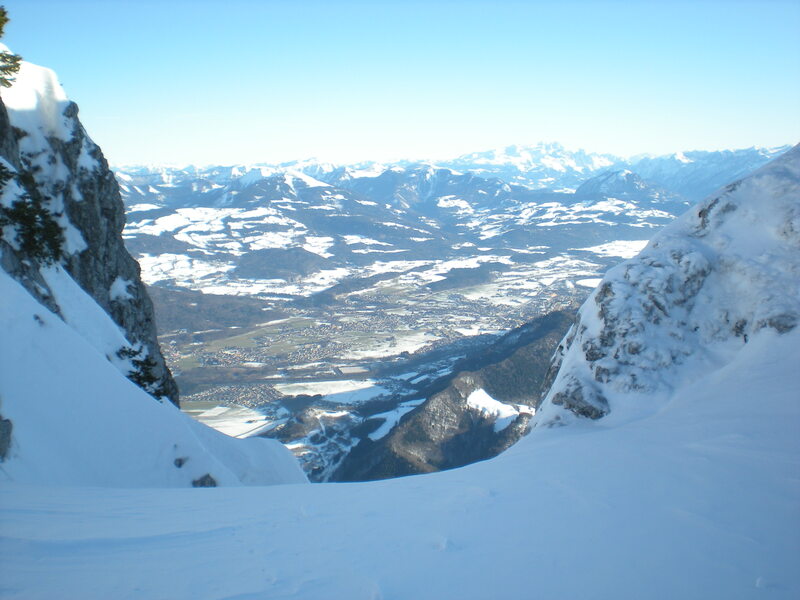 We travelled to Salzburg on 26 December and came back on 2 January (I had to be back at work again on the 3rd. Boo hiss!). It was also nice to be back among mountains. I used to have one outside my bedroom window when I lived in Austria and it was always great opening my curtains to see it. Karlsruhe is possibly the flattest town on the planet (the highest “hill” here is in the zoo… and it’s man-made!) and England isn’t exactly known for its peaks, so even small mountains are something I don’t see every day. While the weather was behaving, we took the cable car up the Untersberg (just outside Salzburg) – Jan wanted to walk up but all the paths were closed due to snow so we weren’t allowed – I was devastated, clearly 😉 At the top there was quite a bit of snow, and also a wonderful view. At midnight on the 31st, we were partway up another mountain – the Kapuzinerberg. That one’s actually in Salzburg and gave us an excellent view of the fireworks while allowing us to avoid the drinken idiots shooting rockets at each other in town. We also went to the Museum der Moderne – a modern art museum on the Mönchsberg. They currently (January 2012) have an exhibition by Evan Penny, which I thought was neat. Unfortunately you weren’t allowed to take pictures in the museum, but basically he makes sculptures of humans and, in this particular exhibition (Re Figured) they’re all distorted in some way. The results are a little freaky but very, very cool. Other highlights included the fortress, where there was so much to see that we didn’t even make it all the way round, and the Haus der Natur, a natural history museum with an attached Science Centre where you could literally spend all day! The only reason we left after 3 and a half hours was because Jan wasn’t feeling too good – we hadn’t seen anything like everything! The Science Center part is all hands on and mostly aimed at kids, but adults can have their fun too! If you ever find yourself in Salzburg and the weather isn’t too good definitely check out the Haus der Natur! Naturally we also had to stop at the Cafe in Hotel Sacher for a slice of Sachertorte (a kind of chocolate cake with a layer of jam in the middle), which was okay, but the best hot chocolate of the trip was definitely the one I had in Demel on Mozartplatz. So thick and creamy it was almost more like a dessert than a drink. Mmmm! And the slice of chestnut cake I had there was delicious too! 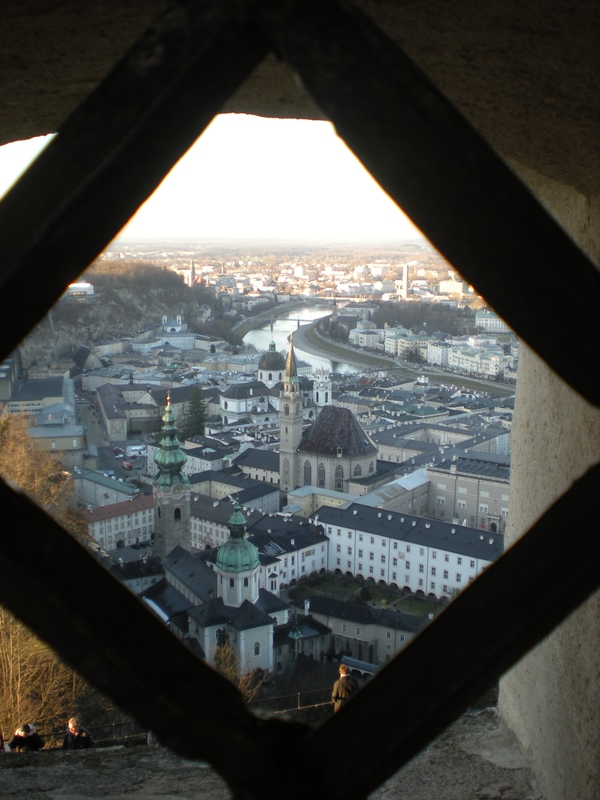 And now I shall leave you with a view of the city taken from a window at the Hohensalzburg fortress. Most of what you can see is the old town, and the river in the background is the Salzach. Still a pretty place, even in the middle of winter. Salzburg, I shall return! I went to a party last night. Just a small celebration, about 15 people drinking beer and eating crisps. It was in my building, one floor above mine, so I didn’t even have far to walk home. J, the giy who’s party it was, had applied to a programme (Fulbright I think) that arranges student exchanges to the US. Yesterday he heard that he’s been accepted, meaning he’ll be given a stipend and sent off to study abroad for a year. I proofread his application for him (it had to be written in English) which is why I was invited to the party. Well, it was a reason. Hopefully not the only reason. So I got my much needed drink… plus several more. Jan and I didn’t get to bed til 4 o’clock this morning! Then this afternoon I went to meet a friend for coffee. We went to a cafe called Zero. They do this amazing hot chocolate. Erakleon or something it’s called – sounds Greek but the menu claims it’s Italian. Anyway, it comes in random flavours like strawberry and lychee or white chocolate and hazelnut and it’s just incredible. It’s so thick that you can’t actually drink it. It has to be scooped up a bit at the time and eaten with a teaspoon. Heavenly! Really it’s not quite cold enough for such things yet (today was gorgeous – sunny and quite warm for the time of year) but I decided to treat myself anyway. I woke up at 5 o’clock this morning because my throat was killing. This is a new one on me – I’ve been kept awake by sore throats before but never had one that woke me up in the middle of the night. It was horrible, nasty sore throat as well – the kind where even the thought of swallowing causes intense pain. So I lay awake for half an hour, quilt shoved tightly up to my throat wishing I didn’t only have an hour of sleepy time left before the alarm went off. Actually a bit of cold air sounds quite appealing at the moment. After three hours of feeling like I was in an igloo with no clothes on my body now seems to have gone into eskimo in a rainforest mode. I still wouldn’t turn down a hot chocolate and a good book though. I’m halfway through terry Pratchett’s Going Postal (for about the 5th time!) and my new one is just begging for me to get started on it. But I shall be brave and go socialise.